I love conferences. I love spending day after day talking and thinking about learning with people who are as engaged and energized by the time to reflect as I am. I love sharing a common experience that can build momentum to re-think and re-evaluate our daily practice of teaching and learning when we get back to our “day jobs”. Mostly I just love the conversation. This is what is so special about Learning 2.008 for me. All the unscheduled time set aside for unconference sessions, quiet reflection, or side conversations, allows us to take the time to process what we’re learning right there, in the moment, surround by those we’re learning with. It was an amazing experience last year, and continued to be my favorite part of the conference this year. Having the chance to sit, together, face to face, with Julie Lindsay, Jenny Luca, Jess McCollough, Anne Mirschin, Brian Lockwood, Brian Crosby, Alan Levine, Clarence Fischer, Simon May, Susan Sedro, Jabiz Raisdana, Tod Baker, Jeff Plaman, David Jakes, Ann Krembs, Mike Romard, Dave Navis, Chris Smith, David Warlick, Paul MacMahon, Amanda DeCardy, Simon Power, Andy Torres, and of course my partners in crime at ISB: Chrissy Hellyer, Tara Ethridge, Dennis Harter, Chad Bates, and Jeff Utecht, was certainly a recipe for rich and engaging conversations. Plus, of course, the chance to see my “conference buddies” – those people you always run into at conferences, but may not keep in touch with over the course of the year (because, sadly, they’re not Twittering or blogging or Ninging). And then there are my favorite people, the people I am meeting for the very first time, but who have been reading my blog or attended one of my sessions and took the time to come up and say hello. It is constantly amazing to me that anything I say here is helpful in any way to anyone else and I just want to say thank you to those of you who read, and who make time to share your thoughts with me. The conversations started with the first Shanghai Edubloggercon the day before the conference. This was my first edubloggercon ever and I just love the idea of bringing together a small group of engaged learners in a loosely structured environment to talk about their common issues, and to share what’s working well in their schools. With the conference kick-off that evening, the group of attending edubloggers and twitters continued to grow, and the “formal” presentations and unconference sessions provided excellent fodder for discussion. I’m surprised at my mixed feelings about having everyone with a laptop. I could see so many people twittering, sharing, researching and reflecting, which is what I expected, but I also saw people playing solitaire during the TED Talk style keynotes, and other people playing games or chatting, and not really focusing on the presentations. I know I couldn’t attend any PD session without my laptop because I can type faster than I can hand-write and I need notes to help me reflect on what I’ve learned. But, what about the others? Are they playing games because the content isn’t engaging? Or are they not engaging with the content? I don’t know, but I surprised myself thinking about it. During one of Clarence’s sessions an attendee asked the question: “Isn’t it the nature of teenagers to want to be doing something different than what they’re told? The more we try to do what we think they like, aren’t they going to go further and further underground? Is it unrealistic to expect that we can even tap into their interests, because their intrests might simply be the opposite of what they see us doing?” I don’t think there was an answer in the session, but wow, that really got my attention. As a teenager, if my teacher was trying to do something they thought I thought was cool, it most likely was not very cool at all. Is that what I’m doing? Yikes! In that same session of Clarence’s there was a student there to set up the recording, but he ended up staying the whole session (not sure why, but he did). At the end, he asked Clarence: “I’ve sat through your whole session and I still don’t understand how the research project my English teacher just made me do is at all relevant to the world I’m going to face when I leave high school. Why do I have to do assignments like this?” Bam! It hit me, here we are talking about them, trying to make our teaching more engaging and relevant for them, trying to help them connect, collaborate and create, but do we ever take the time to explain to them what we’re doing and why? Do we ever ask them if this is what they want? Do we take the time to make our goals transparent to them? Do we ask for their feedback in a meaningful way? I was very surprised to see the lack of female presence in the conference. There were no women involved in the organization of the conference (that I could see during the three days there, or during the final closing thank-yous), even the student-run Geek Squad only had one girl, and there were no female keynote presenters (if only Sheryl had been able to make it, but still, that’s a 1:5 ratio). I remember Wes’ post about a year and a half ago about the need for open conversation and diversity (and a list of excellent female bloggers), it was relevant then and continues to be now. I have to admit, I was a little disappointed to realize that although there were 6 keynote presenters, they were all on at the same time, during only 3 sessions – so either you had to split each session in half to see each keynote speaker or you were just out of luck and could only see 3 of the 6 fantastic speakers that were brought all the way to the other side of the world to speak with us. (Although I was seriously thankful that my sessions weren’t on at the same time as, say, David Warlick). Of course there are still the unconference sessions, but those weren’t announced until someone thought one up, so if you’re like me and you wanted to actually plan in advance to see all 6 keynoters, it was pretty much impossible. I haven’t had a chance to go back through the Ning in detail yet, but I absolutely love how there is one central place to find all of the conference resources. Not only is it incredibly powerful to be able to learn from sessions that I didn’t attend, but I also love being able to see the notes that people took at my presentations. To realize what came across as my main points and to see, first-hand, the ideas that struck a chord with the attendees. Sometimes you don’t realize what the most powerful pieces of your presentation are until you see what others have to say. I will certainly be watching all of Sheryl’s uStreamed sessions, and listening to the many podcasts that were created for about 70% of the sessions. Once again, I was struck by the power of the unconference format. Last year I ran two unconference sessions and I remember being concerned that no one would want to come to a session on those topics, and then being so shocked at how many people had the same questions, ideas or inspirations that I did. This year was no exception. For the first time, I used the Presentation Zen approach to design my presentations and was surprised by the number of people that asked for an unconference session about the topic after seeing my slides. Being able to coordinate a session on a topic I know very little about, but then learn from the group is so empowering and authentic. And now, having all those notes on the Ning to go back and read through gives me the opportunity to deepen my understanding whenever I have time – and this session never would have happened if the conference didn’t include these kinds of unscheduled sessions. Oh, Kim, you are one step ahead of me as I am still to write up a lot of what I discovered at the conference. I really enjoyed the full use of technology. Teachers who played games on their laptops etc would have doodled on paper, when it was paper. Appropriate protocol may never have been followed by them. In comparison, most educationalists were tapping away at their keyboards making notes or sharing interesting outcomes via twitter. I also was concerned that all keynote speakers were on at once. However, if they had not have been, their sessions may have been full, and the lesser known presenters finding their sessions small or nil in number. As to the unconference sessions, the first one that I sat in had 6 people there, none of whom had called the session. Displaying disappointment, they started to drift away until Clarence Fisher and Ewan McIntosh came into the room and I then experienced one of the most interesting sessions of the conference. I liked the way that the notes taken by people were then posted to the ning in reply to the sessional speaker. There is a lot of valuable content to be researched there. I liked the lack of paper…….. In fact I loved being able to attend the conference and meet so many of you face to face, learn from leaders in the emerging technologies field and make connections with so many others. Oops, as usual I hit submit too early, but meant to say I went to the session organized by Jabiz and was rather amazed by the outcomes of interviewing students re their opinions. I asked how they would like to be tested or examined and the geek’s response was ‘they would like to chat ie be part of an audio interview’ – not what I expected!! Good point about the doodling! I hadn’t thought about it that way, but that makes total sense to me. I totally agree about not having the keynoters on at the same time as the “regular people,” I guess I just wish there had been 6 sessions for keynoters so it would be physically possible to see all of them speak. I guess that would mean 3 less unconference sessions, but when you bring such excellent speakers to the other side of the planet, I guess I think it’s worth it! You hit the nail on the head many times with your list of reflection. And though I was not “THERE” in person — I felt the same things as you did and noticed the same things to. However, smiles, though the keynotes were mainly male driven……women did have a vital presence at this conference. Both you and Chrissy’s presentations and unconferences were well-prepared, delivered wonderfully, and caused people not only to talk about it but also to start implementing right away. And I know there were many other women presenters too!!! I thank you for your honesty and your openness to share. Perhaps next year, YOU will be on the planning committee!! How interesting that you noticed some of the same things I did from afar! You really were at the conference – and that is so impressive, considering that so few events were live streamed. You definitely made excellent use of your network! I totally agree about needing to be “wowed” and I think (maybe) there are different expectations for adults, but I’m not sure why there should be. On the other hand, why would an adult spend so much time and energy to get to a conference and then not at least try to pay attention. It is confusing for me, because I don’t think it’s a bad thing to have a laptop open, I guess I just expect that if you do have it open you’re engaging with the content on a deeper level, not using it to multitask. But, hey, maybe my expectations are too high (it wouldn’t be the first time that’s happened!). Thanks for this great post. Brings back some fond memories. I attended the session with the Geek Squad members and came away a little disappointed. They had a fairly negative view of a lot of their classmates and confirmed a lot of the “Isn’t it the nature of teenagers to want to be doing something different than what they’re told?” comment above. They are also very shaped by the end point of secondary school. i.e. their teachers and parents are saying that good grades on Chemistry, Math and Lit papers will get them to an Ivy League institution so let’s make sure we know the first 20 elements of the periodic table, how to factorise a polynomial and plot it on a curve (freehand) and be able to quote lines of Proust verbatim and we will show that we have the makings of a great education. Looks like it is we teachers who are concerned about making them engage with the wider world, they have lots of other higher priorities. If we really want to shift schools we have to show that 21st century learning produces outcomes that go way beyond admission to Ivy League Institutes. Some of the students commenting on http://students2oh.org/ show that we can change thinking but it is not easy. Let’s keep up the fight. What a bummer! I’m thinking the school as an institution has to change before students will the see the relevance of changing – obviously including the parents. We need to find was to educate the wider school community so that we can begin to institutionalize these changes for the students. The board, the parents, the upper-level admin all play a huge role in determining where we as a school place our values. We need to see them valuing global communication, global collaboration, inquiry, and learning how to unlearn so that we can always be learning. 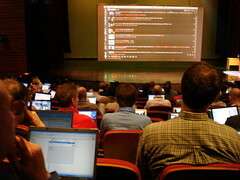 Pingback: Voices of ADE Asia » Blog Archive » TechTrain 2010: Get on Board!